About – Belmont Dramatic Club, Inc. Founded in 1903, the Belmont Dramatic Club is the second oldest continuously operating and performing community theatre group in the United States. 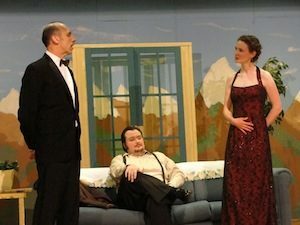 We are a volunteer-run community theatre based in Belmont, Massachusetts, and we celebrated our 100th anniversary during our 2003-2004 Season. Our productions provide unique acting opportunities for talented and motivated performers. The B.D.C. is a non-profit organization, and strives to expand its commitment to serving the community at large and enriching lives through the enjoyment of contemporary and historical live theatre production. We normally do one major show in the fall (with auditions sometime in September or October) and another in the spring (with auditions sometime in February or March). Over the years we have produced a variety of shows, including musicals, dramas, comedies, and mysteries. Also, during the winter we often have social events for members and friends of the B.D.C. If you would like more information about the B.D.C., please contact us.